My appointment was at 4:30 pm but I did not leave her office until 9 pm. It is a very longwait there. The service is good. They are thorough with the examinations and gives you a good understanding of what is going on with your gynecological health. My appointment was at 4:30 pm but I did not leave her office until 9 pm. It is a very long wait there. The service is good. They are thorough withthe examinations and gives you a good understanding of what is going on with your gynecological health. I think the service was great, however, the wait time was ridiculous. I was bought into the room and waited another25 mins to be seen. Then asked to wait again for results, was tired of waiting so I left. I think the service was great, however, the wait time was ridiculous. I was bought into the room and waited another 25 mins to be seen. Then asked to wait againfor results, was tired of waiting so I left. 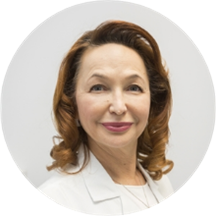 Dr. Irina Mikheyeva is a GYN and Doctor of Osteopathy with over 28 years of experience. She is certified in Basic Life Support and Advanced Cardiac Life Support, and is a member of the American College of Obstetrics and Gynecology and the American Osteopathic Association. She received her medical degree from the Kharkov State Medical University in Ukraine, and her DO from the New York College of Osteopathic Medicine. She is pleased to conduct visits in English, Russian, and Ukrainian. I think she is amazing and does a great check. It was my first time , it was the best visit she made you feel very comfortable. I was waiting for long time, but I can not say that it was bed experience!! I got a lot of attention!!!! Very nice stuff. Also place was nice and clean . Thank you. Her staff was exceptional, beginning with the receptionist, the nurse intake and Nurse Practitioner. I was skeptical, as I’m a recent Medicaid recipient due to the loss of employment and thought I’d only receive sub par service. This wasn’tthe case at all. I will most like continue to see her once I’m back to work with a different insurance provider. Dr. Irina and all of the staff were exceptional. She took the time to explain everything I needed to know. Kind and compassionate people. I absolutely recommend this practice. Promptly Switched to another obgyn. Felt dismissed by doctor - didn’t like the language barrier of assisting nurses. Attitude was very matter of fact- for a first time pregnancy- not warm and inviting at all. WOULD NOT RECOMMEND. Great Dr, I wish if i found her earlier, she is very patient, answered all my questions, she has a knowledge of what she is doing! I'm glad that I found a good dr for me! It worth the wait time! Most pleasant visit I've ever had. Comfortable office and Dr. Mikheyeva was empathetic, efficient, and knowledgable. Everyone I spoke with was so kind and friendly. My new go-to. This was my first time seeing Dr. Mikheyeva. She is an excellent doctor. She went above and beyond with her communication and I felt totally comfortable and like she really cared about my health. Yes, the wait was long but Iwas anticipating that because I had read others’ reviews; I brought a book and the time flew by. I would rather wait a little longer for a doctor that takes her time with me than be seen at my exact appointment time in a rushed manner. But that’s a personal preference I suppose! I would recommend Dr. Mikheyeva without hesitation. The receptionist is very rude. When I was in the room doctor literally dodnthe exam, said next to nothing to me, didn’t ask if I had any other concerns or questions and simply said ok that’s it and walked out ofthe room. Worst bedside manner over ever seen in a doctor. This kind of doctor, in particular, should be welcoming and warm and she is not at all. They also billed my insurance for an ultrasound which i did not have. And when I called to see if my pap results were back I was told there was no pap in the system yet that is what I went for but there were results for the “culture” sample but I would have to call the dr tomorrow. First off, they did charge my insurance for the pap so not sure what that is about and second, if they had other results back why wouldn’t anyone have called me already?!. Will call tomorrow. But horrible office. Stay away. I highly recommend this doctor!! She is a best!! Irina is a great doctor, she was very very thorough with me and professional, I would recommend her to all of my female friends. The doctor is very friendly and professional, the nurse that assists her is incresibly rude and condescending kept asking personal question as to why i changed doctors and insurances and talking down to me rather thn just give me a referalsince I am pregnant she told “you have computer you look it up” then said to me “we do sonogram for you today but this is gift to you we dont have to do ok”.Then the real doctor was really nice, and then the somogram lady looked like she wanted to kill herself, kept scourning me about them not having my other prenatal information (i just switched insurances thus had to switch doctors) and spent ten minutes making faces and sighs and aaid she is ONLY chrcking for a heartbeat and I thought aometjing was wrong. When i get results and doctor talks to me everything is perfevtly normal, they were just stuck on the fact that I had switched and gone there at 6 months, but that is HOW life works sometimes! I would never recomend this spot while your pregnant. My visit with Dr. Mikheyeva went really well. She was really professional and knowledgeable. The wait time was awhile, but I did come late also. I’m definitely coming back to her again! Dr, Mikheyeva was kind, careful and thoughtful with her comments/suggestions for me while discussing my contraceptive preferences- I highly recommend! The doctor was great, the area looked clean. However, the medical personnel who did a pelvic exam pretty much fisted me painfully when I kept telling her to stop and that she was hurting me and had zero bedside manner. Iwas also there for about 3 hours total which is a little ridiculous. If you make an appointment here cancel all your plans. Very clean, updated office. Dr. Mikheyeva and the nurses were all very polite and helpful. Experience with the doctors/staff is always good here but every single time I've waited an hour to 2+ hours just to be seen for 15 minutes which is absurd. I'm pregnant and I'm looking for a new obgyn since this location does not care about your time. I have been going to this gynecologist for sometime now and I always recommend her to any female friend I have. Every visit is always so pleasant even if there is a long wait, she’ll make it worth the wait. Shereally and truly cares about her patients. She sat with me and explained everything I needed to know. I fully recommend her. Her staff is awesome too. Dr Mikheyeva is very kind and knowledgeable. Yes, the wait can be on the longer side but I found it worth it. Doctor was very nice but one of the receptionists is not very professional. She seemed in a rush and somewhat annoyed. The wait was a bit long, but the clinic is tidy and clean. She is very amazing, listens to everything I had to say. It was my third visit as I'm 15 weeks pregnant. They don't have record for their patients. Every time staff asked me that it's your first visit. Its ridiculous and annoying. Wait time is awful. During second visit doctor was eveneating her lunch around 11:00am and came after that for checkup. During my third visit I waited 2 hours. Doctor was checking other patients who came even after me. I'll never go back to this doctor. Just went there after seeing positive feedback on zocdoc. But my experience with this doctor is very unpleasant.